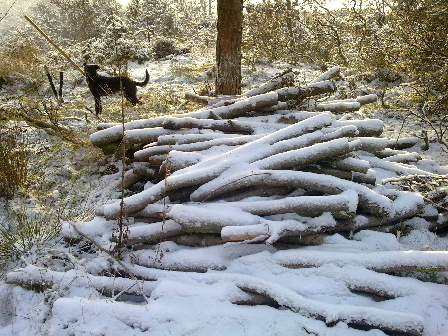 The alder is being felled. There is potential now for this south facing ditch with rough grass, dwarf gorse cover and frequent habitat piles. The snow came! Many of our members did not make it to the site today but a few intrepid souls did! 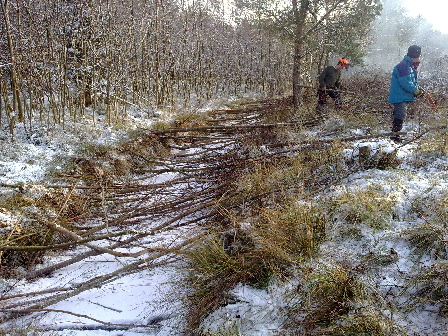 We were coppicing ditch side alder as has been done in the past. This ditch holds good levels of water through most of the year. The ditches are proving important secondary habitats to the lake due to the carp problem of bottom feeding reducing invertebrates and vegetation. 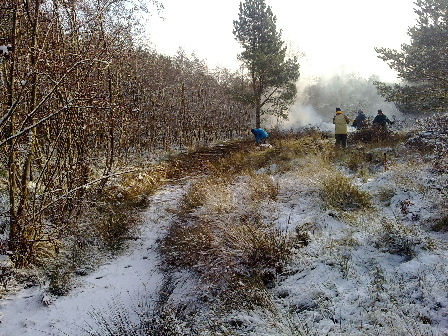 Coppicing allows for the development of emergent vegetation which in turn provides egg laying potential for Great Crested Newts . 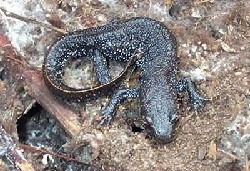 We have Great Crested Newts at one satellite pond at Woorgreens currently and we need to ensure suitable conditions for them to colonise the other ponds.